(Nanowerk Spotlight) Two-dimensional (2D) materials represent the ultimate scaling-down of materials because 2D materials are only a single molecular layer thick. One type of materials that nanotechnology researchers are particularly interested in is called van der Waals heterostructures – assemblies of artificially stacked 2D layers of different materials. By precisely stacking various 2D materials in a predetermined sequence on top of each other, researchers can create materials that, due to their unique interlayer coupling, have special optoelectronic properties; which makes them of considerable interest for next-generation nanoelectronics and other unique devices. Unfortunately, the study of 2D monolayers is plagued by trapped contaminants in between the 2D sheets as well as between the 2D sheets and the underlying substrate. These contaminants make it difficult to obtain precise and reproducible experimental observations. This means that, when conducting investigations, scientists don't know whether they are measuring the intrinsic material behavior or the interaction of the material with the contaminants. And that, of course, impacts the investigations of the fundamental physics of these materials. Clean and homogeneous interfaces are critical for van der Waals heterostructures and any trapped contaminants between 2D layers is leading to poor interface quality. A clean interface reduces the interlayer spacing (which increases interlayer coupling) and leads to a reduction in externally induced heterogeneity caused by trapped contaminants between layers. New findings, reported in ACS Applied Materials & Interfaces ("Nano-'Squeegee' for the Creation of Clean 2D Material Interfaces") by a team of scientists from the U.S. Naval Research Laboratory (NRL), present a simple technique for removing these contaminants in a process similar to a squeegee, which enables unambiguous investigation of the intrinsic properties of monolayer 2D materials. "Clean and homogeneous interfaces are essential for understanding and leveraging the unique physics of 2D materials," Matthew Rosenberger, a National Research Council Postdoctoral Fellow at NRL and the paper's first author, tells Nanowerk. "This has been well known for many years, but it remains challenging to actually obtain clean interfaces in practice. Our work advances the field of 2D materials because we have developed a simple technique for achieving such clean and homogeneous 2D material interfaces, which will aid other researchers in understanding the intrinsic behaviors of 2D materials." 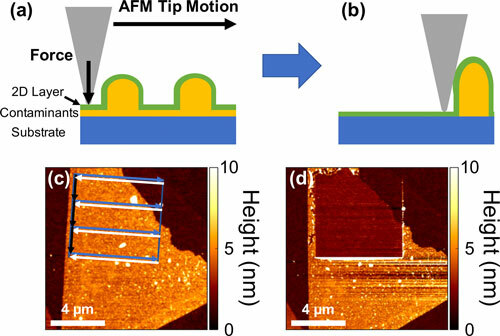 He adds that a necessary condition for successful AFM flattening is that the adhesion between the 2D material and the substrate must be sufficient to prevent contaminants from migrating back between the 2D layer and the substrate after removal of the AFM tip. In their experiments, the team found that this is not always the case. It appears that substrate surface roughness plays an important role in the adhesion between a 2D layer and the substrate. The team's findings should be of interest for other research teams because they have demonstrated a simple technique for creating clean 2D material interfaces using only an atomic force microscope, which is a common instrument in the field of 2D materials. Although this technique can't facilitate large-throughput that is required for industrial-scale processes, it is a new approach for gaining a better understanding of the behavior of 2D materials; an essential prerequisite for developing real-world technologies. "The primary next stage in our investigations will be to utilize the squeegee technique on many types of 2D material samples in order to gain insight into the fundamental physics of these materials," Rosenberger concludes. "Understanding these fundamental physics will help us to design better technologies that are relevant to the Navy, such as wearable and stretchable electronics and cost-effective chemical and biological sensors."